John Nobile has surged ahead with a couple impressive days and is the first Great Divide Race participant to reach Atlantic City, Wyoming. 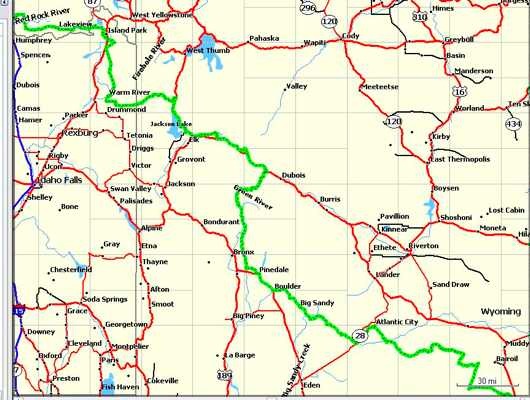 Geoff Roes and Rainer Lenninge have both already passed through Pinedale in that order and should reach Atlantic City pretty quickly barring unforseen problems. David Blaine is camped just north of Pinedale and should reach that check in town fairly early in Friday’s ride. Crunching the numbers on the top 5 on GDR leader board it looks like John Nobile is currently on pace for a sub 16 day race, but Jay Petervary’s record still looks fairly safe at this point. As of Pinedale Geoff Roes and Rainer Lenninge are both at roughly 16 day 12 hour pace. Based on their Flagg Ranch check in times David Blaine is just under 17 day pace while Carl Hutchings is just over it. I’m very curious to see how things shake out Friday. John Nobile has been setting a blistering pace the last couple days. He usually sounds pretty drained every time he checks in, yet he continues to bounce back with big miles once he gets off the phone. We should really have a much better feel for how close he is to record pace after his next check in at Rawlins when we can directly compare him to Jay Petervary’s time.